We are usually confused by the containing food and vegetables that are not eaten up, don’t worry, you can try this advantageous material-the aluminum foil. Comparing with traditional packaging paper, it has many advantages, for example, the surface of the aluminum sheet is very clean and won’t grow bacterium and germ. 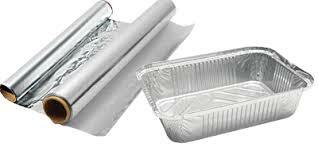 The aluminum foil is non-poisonous，which can be directly used to warp the food, and it won’t cause harm to your health. The aluminum foil is tasteless packaging material, so it won’t ruin the taste of the food. Besides, it has no volatilizaion and the food packaged by it won’t be dry or shrink. No matter in the high temperature or the low temperature, the aluminum foil won’t leak the oil. The aluminum foil is a packaging material that can isolate the sun, so it can be used to package the cream and so on. It has the good fabricability, so it can be used to package all kinds of product. The aluminum is easy to be cut off, so it is easy to operate with it. The aluminum is easy to have chemical change when it is with other metal, so remember do not put it with other metal together. Haomei is the excellent aluminum foil manufacturing company in China, and the high quality aluminum foil produced by them gained lots of appraises around the world, if you have interests in this kind of product please contact us, and we shall give you the best service.